LONDON--(BUSINESS WIRE)-- Imagine watching a season-defining moment, then reliving it from any angle including from the perspective of your favorite player as they run up to take a penalty or make an improbable goal-line clearance. 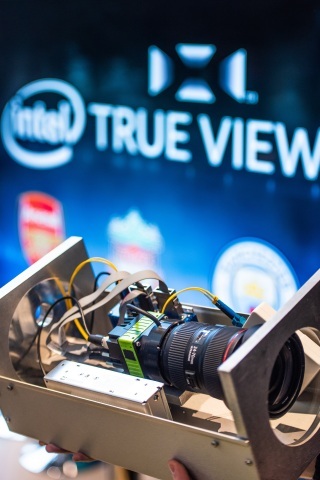 In partnership with Arsenal FC*, Liverpool FC* and Manchester City*, Intel will deliver immersive experiences via Intel® True View at Emirates Stadium, Anfield and the Etihad Stadium. Now their fans worldwide can enjoy the biggest moments of the match from every angle, whether they’re watching the Rights Holders’ live broadcast and highlights or reliving the action post-match from their favorite clubs’ official website, mobile app or social media. As three of the most recognizable and innovative football clubs in the world, Arsenal FC, Liverpool FC and Premier League* champions Manchester City will leverage Intel True View to capture every match element from every angle. Intel True View re-creates the action on the pitch and presents that from an ideal vantage point or player’s perspective, using Intel’s unmatched data-processing capability to deliver the experience to fans. Intersection of Sports and Technology: The sports industry is undergoing a period of significant change as consumer behavior is shifting, driving technology, leagues and brands to address the expectations of fans. In 2018, technology investments into sports reached nearly $1 billion, continuing to drive the intersection of sports and technology. With smart and connected tools, Intel is uniquely positioned to enable the sports industry to capture, analyze and respond to new levels of insight in real time and create amazing new experiences for fans.